Fewer nurses than doctors had the seasonal flu vaccination last winter, according to Public Health England (PHE). While the 2017-18 influenza vaccine uptake in doctors in England stood at 71.1% (up from 64% in 2016-17), the rate for nurses was 65.2%, (up from 58.4% the previous year). 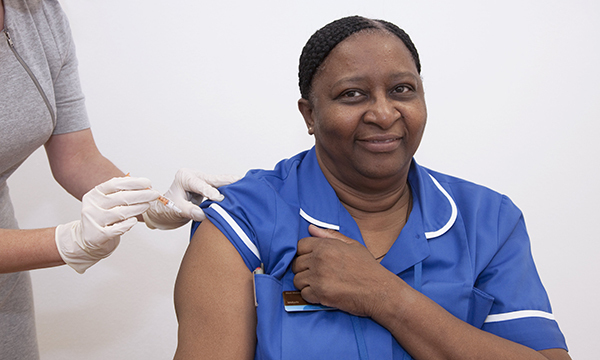 A public health expert told RCN congress last week that nurses considering the flu jab should recognise that a flu pandemic is ‘the number one threat’ to the UK's public health. PHE’s data do however show that practice nurses had the highest overall uptake, at 72.5%, when looking in detail across all healthcare staff groups. Overall, flu vaccine uptake was up by about 5% among healthcare workers in 2017-18 since the previous year. RELATED: Should flu vaccinations become mandatory for NHS staff? PHE respiratory diseases department acting head Richard Pebody said: ‘It is good news flu vaccination uptake in healthcare workers has increased by about 5%. Mr Pebody said PHE wanted to thank individuals and employers, adding: ‘For next winter we encourage any action from NHS trusts and professional bodies to increase vaccine uptake among staff. During RCN congress, Rod Thomson, public health director for Shropshire, who has been involved in disaster planning, contributed to a discussion on low uptake of the flu vaccine among nurses. Also at the college's congress, RCN UK safety representatives committee vice-chair Lesley Pallett said healthcare workers were at higher risk of contracting flu, and one in four front-line healthcare staff would contract it in an average season – and more in a severe season. She highlighted the variation in vaccine uptake across the UK healthcare workforce. Nursing Standard reported this month that 68.7% of NHS staff in England chose to be vaccinated, 56.9% in Wales, 40% in Scotland and 33% in Northern Ireland. Only Wales and Northern Ireland have an uptake target for staff – and both countries' uptake were slightly below it.